Rob and Katey Atema started Rivertop Contracting nearly 15 years ago. Initially the company consisted of the two of them and Brian Wierman, a longtime friend. With one truck and one bobcat, they focused on final grading jobs. Their high quality, fairly priced work earned them more work and the business has thrived. Today they have more than 25 trucks, a large fleet of various industry equipment, and 80+ employees. Rob started Rivertop Contracting and manages the company’s leadership team and the entire operation. He notes he could not have started the business without the help of his wife Katey. Her encouragement and willingness to take up the slack through the throes of startup allowed him to make the company successful. He provides a focus on company branding, community involvement, and long-term goals and vision. But he’s quick to tell you he does whatever it takes to get the job done well, and he doesn’t mind getting his hands dirty. Rob recognizes the important of branding. His goal is to enhance his customers’ brand by creating beautiful spaces and well-manicured grounds while providing the highest level of service in the industry. 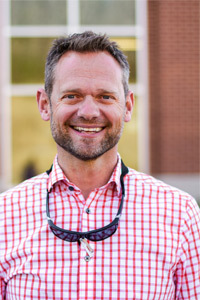 Work background includes common wealth development, Carolina Tractor, and working with Mitchell Distributing Company in Asheville in shop management and new business development. He and his wife have two sons, 3 dogs, horses and a donkey, along with various other animals on their hobby farm. When he’s not working or spending time with family, Rob enjoys boating, craft beer, and building classic cars. 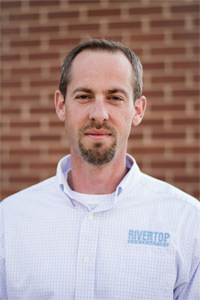 Brian helped found Rivertop in 2000 and has been with the company since that time. He coordinates, manages, and schedules all work for both construction and maintenance. He also coordinates materials, assures quality control, manages employee training, and helps develop and implement policies and procedures. He loves the challenge and satisfaction of creating beautiful spaces and landscapes, and says the great friendships he has developed over the years with my coworkers are a big reason he stays with the company. Serving eight years in the US Army helped Brian develop his organizational skills. He has also completed extensive training in the landscape management field. He is a certified ICPI concrete paver installer, certified segmental retaining wall installer, and a Belgard authorized contractor. When he’s not working he enjoys mountain biking, swimming, craft beer and hiking. He is married with two stepchildren. The family also has two dogs.